Hemodynamically unstable pelvic fractures are a talk-and-die situation. These folks require aggressive, rapid treatment if they are going to survive the injury. Inspired by my mentor, Thomas Scalea, I discuss the management of the unstable pelvic trauma patient. Forgot to mention on the podcast–The combination of an open-book pelvis that you have not bound yet and paralytics is a great way to cause massive bleeding. Bind the open pelvis before tubing!!! An ED Intensivist from NY. Scott Weingart. Severe Pelvic Trauma. EMCrit Blog. Published on April 30, 2012. Accessed on April 22nd 2019. Available at [https://emcrit.org/emcrit/severe-pelvic-trauma/ ]. Unless otherwise noted at the top of the post, the speaker(s) and related parties have no relevant financial disclosures. Already an EMCrit CME Subscriber? Not a subcriber yet? Why the heck not? If you enjoyed this post, you will almost certainly enjoy our others. Subscribe to our email list to keep informed on all of the Resuscitation and Critical Care goodness. This Post was by the EMCrit Crew, published 7 years ago. We never spam; we hate spammers! Spammers probably work for the Joint Commission. Suggestion for securing sheet used for pelvic binding since I will need to transfer the patient? Read M. McGonigal’s blog. He mentions applying AP pressure and lateral pressure to the pelvis. You mention pushing inward. He states not to use binder if unstable with lateral pressure. Are you describing lateral or medial pressure? Can you clarify and are there times I should not place a binder with suspected pelvic trauma? I transfer all but minor trauma. It is lateral to medial, but if there is actually an open book there is an inwards rotation aspect as well. Imagine closing an open textbook whose covers are sitting a little bit less than 180 at the start. Great podcast Scott. Even our big trauma centres in Oz don’t get near the volume of trauma you see, so always good to hear your thoughts. Like the pushing iliac crests in as the screening test, this gets discussed a lot at ATLS/EMST courses! Are there any special considerations when performing pelvic binding on patients with a gravid uterus? great question. i am only postulating here, but I think it pure open book, it would be the same as you would close down the same initial volume. I would be scared if there were fracture fragments, but not really sure. Shouldn’t we make a distinction between immobilising the pelvis and ‘binding’ or ‘compressing’ the pelvis? Binders make sense in open book fractures to restore anatomy but over-exuberant tightening in lateral compression-type fractures could worsen the deformity (and possibly cause further vascular injury). We only bind expanded pelvises (AC), we don’t bind LC injuries. If you accidentally do, unlikely to make the injury worse (though still not a good idea). ‘Closing the pelvis’ does not prevent this and the binder is not used to reduce the volume of the pelvis or achieve perfect anatomical alignment. . The pelvic binder is used to splint the bony pelvis. The binder splints the bony fracture, approximating bone ends and reducing low-pressure bleeding from bone ends and disrupted veins. As the fracture pattern is often unknown at this stage, it is possible to exacerbate certain injury patterns if excessive force is applied. This is particularly true of severe lateral compression or vertical shear injuries. It certainly is one reason why the C-clamp is falling out of favour. Indiscriminate application of force can be deleterious. A pelvic binder is not a splint for the pelvis. We don’t place them for LC or vertical shear injuries. Their purpose is to move the pelvis not to stabilize the pelvis. 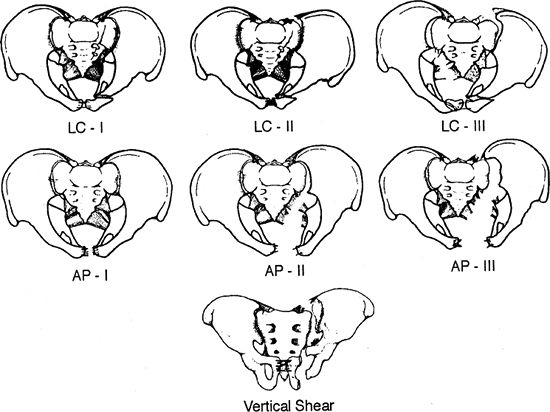 If the pelvis is already closed down (VS) or compressed (LC) then there is no purpose to placing the binder. Can you please use a real name and some indication of your profession/affiliation when posting. Much thanks. The quote I provided in my previous post that argues against this is from the trauma.org site. The original article even provided the primary research that suggests the predominant mode of action of the binder is to prevent fracture movement and further vascular/clot disruption. There is reinforced by the evidence that accurate anatomical reduction (via surgery) does not actually improve the major endpoints of transfusion requirement or mortality. Not sure how we are disconnecting. A splint takes an existing alignment fo a bony structure and stabilizes it. If the pelvic binder was a splint we would be putting it on LC and VS injuries. We do not do this because the purpose of the pelvic binder is to move the bones; its purpose is to take an expanded AC injury and bring the bone ends into alignment. As to the mechanisms as to why this helps with hemodynamic instability and pelvic bleeding, they are debatable but I agree with Karim that we are not tamponading the bleeding simply by “closing the pelvis.” This in no way changes the fact that closing the pelvis is indeed what I and Karim are seeking to do and why we apply the binder in the first place. I am no longer sure what you are trying to get across. In some of your earlier comments, you elude to the dangers of binding an LC injury, now it seems you are stating that the binder should be used as a splint which would imply a utility for all pelvic trauma. I’m sorry if I have misunderstood. If no pelvic fracture, take binder off. The key point is I only see a binder has a means of stopping the fractures ends wobbling around to prevent further bleeding. If the patient is crashing despite the binder and blood then they are likely to have an arterial bleed and that ideally means angio. If you don’t have access to angio, the patient is in a real pickle. Keep the binder on, laparatomy, pack pelvis ++, stabilise enough to get an angio facility. Trying to achieving anatomical reduction (even with emergency ex fix) in this situation is not going to make any difference. I said ‘consider’ adjusting binder depending on injury pattern. But to simplify – put the binder on correctly and firmly without excessive force (noting that not all binders have tension limiters). If there is a fracture potentially involving posterior elements, leave the binder on (regardless of AP, LS, VS). I repeat, the main purpose of the binder is to stop the fracture moving around (disrupting clot) – not to change the anatomy. But clearly if your binder is contributing to distortion of anatomy then maybe you need to think about adjusting it. Ultimately, making adjustments with the binder is not going to make a difference in the crashing patient, they need angio. at 10:00 the podcast discusses DPA (also termed ‘diagnostic peritoneal tap’/DPT in other literature). i’d like to learn more about the technique, but havent really dug up anything definitive online about how to do it. Ie: what size needle? are you accepting bowel puncture but regard it as insignificant with a small gauge? i see discussions about just doing the first part of DPL as DPA, but that seems like it would be a very involved process compared to just ‘sticking in a needle’. is anyone aware of something online to learn more about this technique? DPA can be percutaneous or open. Perc takes a minute; open a while longer. The perc dpa kit is a blunt tip 20G or 18g. The blunt tip makes bowel perf much less likely but requires a small scalpel skin incision. The kit is just the needle with a cath over it or a needle, short wire, and small catheter. that makes sense. thanks for the explanation. sounds like a veress needle would be the obvious choice- is that what you mean, or are you suggesting spinal-type blunt? (would be a nice option for folks without access to veress needles). i am still frustrated i cant learn more specifics online, whereas every other procedure always seems to have plenty to read up on. searching for ‘perc peritoneal tap/aspiration’ doesnt really turn up anything except studies comparing veress vs open access to place a DPL catheter (summary: veress introducers are great). i see Arrow has a perc DPL kit which includes the same introducer/catheter combo as they do for at least some of their CVC kits, which suggests a standard vascular needle. i woudl be pretty tense pushing an 18g cutting needle into someone’s belly..
Love the work you do, simply amazing. I appreciate all the work you do. Thanks for the great CME.